Family Money: Cash Deposits or Money Funds? As a result of the stock market turmoil and loss of investor confidence in financial institutions, cash has regained the throne, even if only temporarily. In the past three years equity investors have seen their portfolios fall in value by more than 50%, while investors with crystal balls or precogniscence put their money into high-interest deposit accounts or fixed rate long-term deposit bonds, and earned 4% or 5% a year. Stock markets will continue to be volatile and difficult to read as long as the wider global economic picture remains weak. In the process cash has suffered too. Interest rates are being cut by most central banks to bolster stuttering economic growth. Rates in the US, Europe and the UK are at 40-year lows. Yet cash will remain an integral part of any expat’s finances. Savings rates may not be high, with offshore accounts currently topping around 4.5% for sterling denominated deposits, 3% for euro-denominated ones, and under 1.5% for US dollar accounts. Not exciting – but your money is safe, accessible, and earning something. Providers of money market funds (MMFs) boast that these funds give you the security of a bank deposit, but with a better rate of return. These collective investment vehicles put your money into a range of socalled “money market instruments” – high-interest deposit accounts, inter-bank deposits, floating rate notes, certificates of deposit, short dated bonds, and so on. Managers sweep cash around the globe searching out the best rates for your money. For example, many banks or deposit accounts pay a “headline” interest rate for a short time but then lower it once an account has attracted a sufficient number of savers. MMFs can avoid losing out to such marketing practices by shifting money to the best accounts. Most MMF managers charge a management fee, which cuts into a fund’s performance, and some charge an entry fee as well. But whether or not you should switch assets out of deposits and into MMFs depends on your attitude to risk. Despite looking good in theory, most MMFs have failed to perform well enough over the long term to win the argument against investing in straight deposit account or fixed rate savings bonds. In the past year some MMFs have performed well, but the average performance of funds over three and five years is nothing wonderful – in fact, most have significantly underperformed deposit accounts. The top five MMFs returned at least 20% over three years – 6.66% per year – and the top three about 30%. But further down the list and performance over three years shows losses greater than 20% – comparable to equity funds – although in the past year several of these poorer performers have bounced back to head the sector, reporting positive returns of over 20%! To my mind, such volatility is worrisome and associated more with equity funds than safe and reliable cash accounts! How do you gauge which will be a top performer next year - or a lemon? In short, MMFs can beat deposit account rates but over the past three and five years they haven’t. If you want a safe place for your cash, then the argument for savings accounts still stands. Rates will be higher the longer you can afford to tie up your money, the best rates being those of fixed-rate bonds that typically tie up your money for three, four or five years – and for bigger deposits. The best fixed rate account available at the time of writing was paying 4.75% for a sterling-denominated one-year fixed-rate bond (Isle of Man-based Irish Nationwide), which is a good rate given the general economic conditions. There is another, more direct competitor to standard deposit accounts and MMFs: the plethora of market-linked guaranteed offshore savings products launched in the past year or so, with new ones being launched virtually every month. Essentially these products are deposit accounts that typically lock up your money for three, five, or eight years and link any interest rate or growth you may get to how one or several stock market indices or basket of funds performs. Guaranteed products come in an enormous variety of shapes and sizes, but the underlying selling point of all guaranteed products is the same: like a standard savings account, your initial deposit or investment is safe, but if the stock market(s) or funds to which the product is linked perform well, at maturity you will receive a proportion – but not all – of that growth. Your can’t lose your money – hence the word “guarantee” – and the worst that can happen is that if the index or investment the account is tracking falls or underperforms, you get back just your initial deposit without any growth. However, if you need to get at your money before the 5- or 8-year maturity date, you will be charged an ‘early’ withdrawal penalty – which might be quite high. You really have to buy and forget these investment instruments, and hope the markets to which they’re linked do well between now and maturity date. It’s the easy way for nervous investors to protect their capital while taking a gamble on the markets at the same time. In the competitive fight for your money, then, which wins? Deposit accounts, MMFs or guaranteed products? Deposit accounts are the safest and some offer good returns. Guaranteed products are slightly less safe, being exposed to inflation, but offer potentially higher rates of return for your money. MMFs can do well, but the sector as a whole is relatively volatile and performance variable and inconsistent. The average is better than deposit accounts over one year but worse over three and five years. Is the potential upside worth the added risk, especially when there are guaranteed products available? It depends how adventurous you feel. And if you feel adventurous, why not buy some selected equity funds? Now that would be brave! Have you ever thought of introducing games to your meetings to spice it up a little and to - most importantly - get the message across! You might think it’s a bit ridiculous and not quite “business”, but for anyone who has the responsibility of conducting meetings then clearly this approach to making meetings work, is definitely worth thinking about. Let’s face it, most of us become immediately disinterested when it comes to attending a meeting, unless we know that something different is going to happen! How do you keep the board meeting from becoming a “bored” meeting? The same question, of course, could be posed for staff, sales, or committee meetings, or, for that matter, for just about any kind of group get-together. How’s your team functioning? Could meetings with your team members be more productive? Ask almost any colleague or member of your staff about meetings and you’ll likely get a response clearly less than positive. In fact, many of us would emphatically state that far too many meetings are a waste of time. Unfortunately, in many organizations, they are! But a certain amount of “meeting” must happen as it forms part of the business ritual and necessity to getting things done. Sound familiar? I’m sure it does. How about the meeting you ran the other day? How much time and money are wasted every day in meetings that are unproductive? Every business day, wasteful meetings are held - far too often with the same negative results. Games, however, can make your meetings more engaging, more productive, and more cost-effective. Yes that’s right - GAMES! Games have been used to supplement and upgrade meetings ever since it was discovered that people have very short attention spans! In fact, studies claim that the span of attention for most of us varies anywhere from ten seconds to three or four minutes! It’s easy to see, then, why people become easily bored (or overwhelmed) with technical material and respond much better when a meeting has life and variety. In addition, our television-oriented society has conditioned many of us to expect drama, excitement, and involvement in our everyday lives. In short, group members expect meetings to be lively, fast-paced, innovative, participative and imaginative. (Just for the fun of it, how many of those words describe your last meeting?) Games can materially help accomplish these objectives by focusing attention on the needs of the attendees, not on those of the meeting leader. 1. Are quick to use. They can range for a five or ten-second physical activity, through to a one-minute visual illustration or verbal vignette, up to a 20 or 30-minute group discussion exercise. However, since the activity should be used to add or supplement the main purpose or content of the meeting, the time devoted to the game should be minimal. 2. Are inexpensive. In general, nothing has to be purchased, nor does an outside facilitator or consultant have to be engaged. Perhaps the addition of simple props can add emphasis to a point, but this doesn’t have to cost much at all to add realism to the activity. 3. Are participative. To be used effectively, games should involve participants either physically or psychologically. Games typically help people to focus their attention and make them think, react, speak, and, most importantly, have fun while doing their jobs! 4. Are adaptable. The best activities, like the best humorous stories, can be adapted to fit almost any situation, and reinforce the points that you want to make in your meeting. They can be modified slightly and still retain their original flavour and character. 5. Are single-focus. Games are best used when they demonstrate or illustrate just one major point. As such they are geared to micro issues as opposed to macro issues and the simpler they are and the more focused they are - the more they will do their job for you! All of this doesn’t just happen - you as the leader of the meeting have to plan and prepare - and the more effort you put into it at this end in the initial stages, the far greater the results. Carefully selecting the correct strategy to ensure the game will have the desired effect is paramount. Perhaps you want to make a point without lecturing, uncover people problems in a department, spark lively group discussions - planning and preparation is everything. Why are games good learning experiences? Basically we can say that people learn best by “doing”. It is a proven fact that people remember something much better if it is tied to some kind of active, physical involvement. Since games and activities invariably have built-in participation, this stimulates the learning process and people are very responsive to this factor. Games can be powerful tools to induce motivation in people. They can be useful avenues to stimulate problem solving. They can be useful starting points to get group members to accept the need for change and begin to act on that need. Games can create a climate of openness and constructive confrontation - in a “safe” environment - to reveal and address hidden problems. They can be valuable stimulants for legitimizing candid conversation about what it means to be a team. Games can be very effective in identifying “communication breakdown” and ways to improve upon it. Although it might seem that games are designed just to have fun, in reality most games can communicate a point more effectively than just talking. If you need some direction in order to make your meetings work better and do what they are supposed to do, then please contact me by email at [email protected] - Asia Training Associates. Our programs are designed to provide you with the appropriate methods and tools to get the most out of your meetings. It seems that we have just gone through a coughing season. There have been croaky coughers everywhere you turn, all sneezing away, hoping to get rid of their infection by passing it on to you (or me). So far I’ve avoided it, but I must admit I have held my breath in a couple of lifts while someone is happily filling it up with freshly coughed and incubated germs! This is not really paranoia on my part, the way these epidemics are spread is through what we call “droplet infection” as every time a sufferer sneezes or coughs they spray bugs into the atmosphere, just like you spray aerosol mozzie killers from the pressure can at home. You then breathe in this cloud of bugs and if you are unlucky, they like you and quickly settle into their new home - your lungs! Now many people when they start to get those initial symptoms of a scratchy throat, a bit of a sniffle and then good old gut wrenching coughing, race off to the pharmacy and ask for their favourite coloured antibiotic, or whatever the pharmacist decides you should have this week, and that generally means the expensive ones! Now this is a case where the most expensive is not necessarily the best (for the condition or your wallet) and you should really think twice before charging into the chemist. To begin with, is your condition caused by a bacterium or a virus? If caused by the latter you will need an anti-viral, not an antibacterial. Another name for an antibacterial is an antibiotic. So, if your infecting agent is a virus, you can take as many expensive antibiotics as you like, they will not clean up your lungs (but will clean out your wallet, as mentioned before). This is a good reason why you should not just start throwing antibiotics down your throat like M&M’s. Now how do we medico’s work out whether your infection is bacterial or viral? Well, after asking whether or not the sputum is clear or coloured, we can ask for a sputum sample and get the lab to try and grow the bug. After getting the bug growing, we then feed it an antibiotic and see if it keels over. This is called a ‘Culture and Sensitivity’ in lab speak. Then there is a little thing called ‘clinical acumen’ which is the ‘gut feeling’ that doctors get after many many years of looking and listening. It also helps if you are in the middle of an epidemic and every one this week has been caused by Staphylococcus aureus, then it is also fairly likely that you have got that particular bug too. What I am really proposing is that you should not rush to the pharmacy at the first sign of a cough, but you should take some symptomatic treatment initially (soothers for the throat and even a cough suppressant) but if the condition continues and/or gets worse, then it is time to see the doctor, not the pharmacist. I fully realise that the pharmacists are now going to make effigies of me and stick them to the wall with skewers, but I don’t care. In my book, doctors prescribe and pharmacists dispense. It’s that clear-cut. I believe that arrangement is also better for you, the patient. With the new ban on smoking in restaurants and many of the public places, my husband has decided to give up smoking. He has tried many times before (he has been a smoker for almost 30 years) and every time has been unsuccessful. He does seem to be truly interested in giving up this time. What can I do to help? What a wonderful wife you are! What can you do to help? Well, the first thing would be to understand that he is going to be in for a rough time for a couple of weeks. Plan some activities that he enjoys, so that he is not left sitting in front of TV with a beer, thinking about the cigarette he wants to smoke. Stay away from friends that smoke and would be likely to offer him cigarettes, and continually reinforce his decision to quit. Suggest going to dinner again, now that he can taste the food. Finally, get rid of the ashtrays in the house. Lots of luck to you both. You may find this a strange request, but I am an American interested in Buddhism and wondered if it would be possible that on my next holiday here I could join a monastery. I would only have two weeks but imagine that in that time I could at least get the basics of Buddhism. Is this possible? I don’t mind where in Thailand that I would go as I am interested in the study, not the geography or tourism side. I have always been impressed watching the orange robes going along the streets with their begging bowls in the mornings. There is no such thing as “strange requests” in Hillary’s letter box these days! I think I’ve seen them all. Now, to yours. If you want to understand the basics of Buddhism, you have to start long before you get on the plane to come to Thailand. To begin with, have you looked to see if there is a Buddhist temple in your region in the US? Discussions with the monks there will assist you in your quest. Monks in America can generally all speak English, while in the temples here, they naturally speak Thai and you would be lucky to find someone fluent in your language. I would recommend that you get the following books before going much further, “Buddhism Explained” (ISBN 974-7047-28-4) by Khantipalo Bhikkhu, “Phra Farang, An English Monk in Thailand” by Phra Peter Pannapadipo (ISBN 974-202-019-1) and “The Good Life. A guide to Buddhism for the Westerner” by Gerald Roscoe (ISBN 974-8206-56-4). Read these before ordering the saffron robes, Petal. The beautiful girls of Thailand amaze me the way they can sit sideways so gracefully on the rear of a motorcycle. When did this custom start and do they fall off? Traditional Thai dress has included the long wrap skirt for many years and the Thai women have ridden buffaloes, elephants and oxen long before the Japanese motorcycle invasion. Riding side-saddle is an example of Thai practicality. Imagine wearing a tight skirt and throwing your leg over the Honda/Yamaha/Suzuki 125, the ideal motorcycle for a family of four. Impossible! But you can sit sideways. Do they fall off? Yes they do, but only if the rider loses control. At last you have included some success stories in your column. Remember the very famous song “I got you babe” (Sunny & Cher) that everyone who reads this column knows. It is about two people who fall in love and think love will pay the bills. Well it does not work in the UK or America or anywhere as we all know. Two years ago I met a bar girl in Pattaya who was from Isaan. She was intelligent and very proud of her family - did not like her work - but as many do, did it for survival reasons. She went back to her village 2 months after I met her and has now her pride back and works in a simple family business and earns less than 150 baht a day. I send her help every month and visit her village 3 times a year - and when I visit I am treated like a family member by all her family. We intend to get married in 1 year time and yes you have got to provide for the one you love no matter where you live in the world, but the rewards in Thailand are well worth it. Hillary will print success stories, when successful people send them in, but the successful ones are people who are happy in their relationship and do not need advice from an ‘agony aunt’ column like this one, so this is why you do not read them so often. Your point is well taken and should be understood by everyone who is contemplating entering a relationship anywhere in the world. Love (alone) does not pay the bills. There is an obligation to provide and I am very pleased to see that you have accepted that, and that it is working out for you, but remember too that one couple is not every couple. Interesting that you picked on a Sunny and Cher song - remember what happened to them? Our sister publication, the Pattaya Mail this week has reached the epoch making 500th issue, so in honour of that, we decided to pursue the 500 theme in the regular columns. Since 500 photographs needs 14.888 rolls of film, that did not look like something that was worth a column. For me, the only real connection with 500 and photography is the shutter speed of 1/500th, so here goes. What can you do at 1/500th? Well, I’ll start by saying something that you probably can’t do at 1/500th - and that is to synchronise your flash burst and the shutter speed, unless you have a camera with the shutter in the lens. If you try you will usually get a black half of the print. So what can you expect? Well, at that shutter speed you should be able to stop a train in action, a runner, a bicycle and a car in the suburbs. You won’t stop a plane or a racing car or motorcycle, as they generally need shutter speeds of 1/1000 or faster if you really want pin-sharp frozen action. However, if you’re into sport, set the shutter speed on 1/500th. What you also get at 1/500th is a huge aperture at most light levels. F16 @ 1/60th is the same exposure value as f5.6 @ 1/500th, the only difference being that at f16 you get depth of field, but at f5.6 you do not. So photographs taken at 1/500th will tend to have nice, out of focus backgrounds. Portraits then taken at 1/500th will look spontaneous, because the shutter speed is fast enough to stop the action of talking, shaking the head, fluffing the hair, and the like, but will not have enough depth of field to give you an untidy, distracting background. Try this, especially if your lady has long hair, and you will get a very professional ‘advertising’ look in the finished product. I mentioned Exposure Value (EV) in the 500 piece above, and perhaps it is time to refresh your memory regarding EV’s. The EV is a measure of the amount of light that comes through the camera lens and falls on the film. It is a measure of aperture (f stop) related to time, and can take into account the sensitivity of the film (ASA/ISO rating). 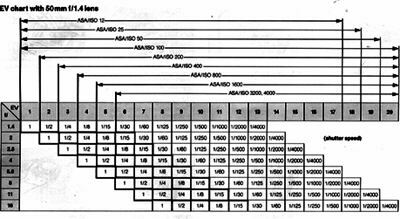 It is an “artificial” scale in that we have said that EV 1 is assumed to be 1 second exposure @ f1.4 for 100 ASA film. As you progressively shorten the exposure (shutter speed) or decrease the amount of light coming through the lens by selecting a smaller aperture, the EV number increases. Look at the chart. EV 1 is 1 second @ f1.4, while EV 2 is half a second @ f1.4, or 1 second @ f2. Confused? Don’t be, just remember that if you want a constant exposure level, then you are actually dealing in EV numbers. Once you know the EV, then you can change the way the photograph appears by altering the shutter speed and aperture together to maintain the same EV. Hasselblad lenses with the shutter in the lens are called “coupled” because once you set the EV you can turn the lens barrel and automatically get the correct parameter you need. This is based on an old traditional Indonesian recipe (Bregedel Jagung) that can be served hot or cold. Careful draining of the oil after cooking is important as they should retain a crunchiness, rather than an oiliness. If required you can increase the amount of chopped prawns, but then correspondingly decrease the amount of sweet corn. Drain corn kernels and crush slightly. Mix spring onions, garlic, corn, salt and pepper. Beat eggs lightly and fold in the baking powder and plain flour, then continue with corn mixture, prawns and coriander. Stir well until batter is homogenous. In a pan, heat the oil and gently drop in heaped teaspoons of batter mixture and cook till a deep golden brown colour. Lift out with a slotted spoon and drain well. Serve immediately as an appetizer, or they can be served cold or quickly re-heated in the microwave on the following day. I promised in the last issue, that this week we would look at some of our readers’ questions regarding tuning the Windows Operating System. Think of this in much the same way you would tuning up your car to run better, faster and more smoothly. I have concentrated on Windows 98 but some of these tweaks can be applied successfully to newer operating systems. I have been using Windows 98 Second Edition for 3 or 4 years now. The system is so slow, I can go and make breakfast when I turn the computer on. Also, more often than not it hangs during the boot up and I can then go and have lunch. I am thinking of upgrading to Windows ME, NT, 2000 or even XP. My PC is a Celeron 400 with 64K Ram and is about 2 years old. Windows 98 usually works OK, but the system hangs for no reason. Can I just upgrade to XP? Curious, Wat Gate Chiang Mai. A: Windows 98 is quite possibly the most elaborate operating system ever created for home and small business use. Due to its complexity and the fact that Windows 98 tries to be all things to all people, Windows 98’s default setup may not represent the optimal configuration for your PC. Hence the hanging problem you mention. I would not recommend upgrading the Operating System without considering upgrading the PC at the same time. Windows 98SE may have some instability problems, but it really does work well on older PC’s. Do not upgrade to Windows ME regardless of any friend’s commendations. Even Microsoft acknowledges that the release of the ME Operating System was a mistake. Also, it is much slower than Windows 98SE. I’ll grant that it is more stable. Let’s get started by looking at the most basic and most effective method of making Windows 98 run faster. The Windows 98 environment isn’t composed of just a single program. Instead, it’s a collection of many smaller programs that work together to accomplish the monumental task of providing a truly diverse operating system. Although most of these programs are required, some aren’t. Programs that aren’t required to keep the operating system functional eat up valuable system resources. For example, using Screen Savers uses a large amount of system resources. I imagine that you will have Winamp or a similar sound player installed. Plus many people like to use Wallpaper and Screensaver Applications that give your desktop some pretty pictures when you’re not using the PC. All of these applications are started when Windows is started and they all use some of your precious system resources. You do need to have your Firewall and Antivirus running. You also need to have the clock running and probably the Display Utility that came with your PC. Apart from this, there is no need to have anything start up until you want to use it. The system tray on the right hand side of the Main Windows Start Bar shows which utilities started with Windows. Look at each small icon and right click. This will usually pop up a menu where you can either disable or turn off the Application. Also look in the Start Up Folder in your Programs Menu. This is also where some utilities are set to start with Windows. Move these to their own Directories or to Accessories where you can start them when you want. My own computer only has Sound, the Firewall and Anti-Virus running at startup. Everything else is disabled until I want to use it. I live outside Chiang Mai and my PC is badly affected with slow and fluctuating electrical current. My computer’s performance fluctuates as badly as the current. Recently I can go and have a shower while I open a picture sent to me by a friend. A: The simple answer is to consider how to boost your system’s performance. Windows 98 offers many tuning mechanisms that will help you boost the performance of your system. You can use many of these mechanisms by going to the Control Panel and selecting the System icon. When you do, you’ll see the System Properties sheet. Select the Performance tab, and you’ll see a summary of your system’s free memory and other resources. There are three basic ways in which you can tune from this screen. First, check out the file system by clicking File System. When you click this button, you’ll see the File System Properties sheet. Take a look at the Hard Disk tab. Now, set the typical role of the computer to Network Server—even if the system isn’t networked. Doing so increases the number of cache buffers and increases the system’s performance in some areas. You also should set the read ahead optimization to Full. Second, take a look at the CD-ROM tab. Set the Supplemental Cache Size to Large and set the Optimize Access Pattern for Quad Speed or Higher. These settings make a huge difference to your file system. You can test the settings on other tabs, BUT I recommend that you do not enable the Write Behind Caching On Removable Drives—doing which can lead to data loss. Stay away from the Troubleshooting tab, too. Items on this tab can slow Windows down drastically; in some cases, playing with these items can indirectly lead to data loss. The last place to examine is the Graphics button on the System Properties sheet’s Performance tab. Click this button and display the Advanced Graphics Settings dialog box. Unless you have a really old graphics card, set the Hardware Acceleration to Full. That way, you’ll gain the full potential of your graphics card. Other solutions include defragmenting the Registry and the Hard Drive. This can make a huge difference to performance. Norton and McAfee are the best known System Utility Applications. Norton started life creating the original system utility for tuning Windows systems many years ago. I do not like either. Both are resource hogs and take over the computer to perform their functions. I recommend that you look for and install OnTrack Fix-It Version 3 for older Windows Versions or 4 for NT, 2000 and XP. This utility is small, sits quietly in the background, and fixes most windows operating system problems in one easy tune up. It’s also easy to use. I read somewhere that Windows Wallpaper and Screen Savers should not be used. What do you suggest? A: Yes I agree with what you read. Turn off Windows wallpaper and screen savers. You may never have thought about it, but several very basic Windows 98 components consume resources and slow down your system. For example, Windows wallpaper is a resource hog. Using Windows wallpaper, especially a large photograph, can slow down the video updates on your screen dramatically. Likewise, screen savers can bog down your system. Keep in mind that Windows 98 is a multitasking environment. Often, Windows uses idle processor time to perform various types of system maintenance. A screen saver can slow down these tasks or even prevent them from running at all. When a screen saver isn’t active, there’s always a counter that runs in the background and starts keeping track of elapsed time after a key is pressed or the mouse is moved. This counter also consumes system resources. Instead, I suggest that you turn off the Monitor to save the screen getting burnt. I use MS Word quite a lot to write letters and prepare notes for my teaching class. When I started, it was exciting to discover that there were so many fonts available on the Internet. Over the last 2 years, I guess I have loaded around 2,000. The result is that I rarely use most of these fonts anyway. Also I notice that Windows has become very slow. Is this because of the age of my computer and is it time to upgrade? One surprising waste of system resources is the Fonts folder. Windows 98 works well with the built-in fonts and a dozen or so extra fonts. However, Windows 98 requires resources to support each installed font. As you add more fonts, Windows runs more slowly. To see for yourself, just add a few hundred fonts to the system and watch how slowly Windows runs. You should remove any fonts that you don’t use regularly. Start by opening the Fonts applet in the Control Panel. Next, select a font and choose the Delete command from the File menu. If you want to weed out the fonts that are similar to one another, you can select the List Fonts By Similarity command from the View menu. Then, you can select any given font from a drop-down list, and Windows will tell you how similar the other fonts on the system are to the one that you’ve selected. I also suggest that you empty your trash. Another resource hog is the Recycle Bin. Windows 98 depends on having ample hard disk space. When you delete a file through Windows Explorer, the file is copied to the Recycle Bin and encapsulated into a package that helps Windows know how to restore the file (if necessary). Ironically, however, the deleted file consumes more disk space in this encapsulated form than it did before you deleted it. For example, if you were running low on hard disk space, you might decide to delete some old files. Unless you clean out the Recycle Bin after you’re finished, you’ll lose even more hard disk space by deleting the files. So, clean out the Recycle Bin regularly and keep Windows running properly. Do you want to keep your Recycle Bin empty? If you’re sure that you want to delete a file, hold down the [Shift] key and press [Delete]. Doing so permanently removes the file instead of storing it in the Recycle Bin. Get rid of that Internet cache. Have you ever watched your disk space slowly disappear, and you didn’t know where it went? If so, then there’s a good chance that the Internet Explorer cache is using a really big chunk of hard disk real estate. Most Web pages are made up of multiple files, including the HTML file that creates the page and various graphic, sound, and script files that display on the page. Before Internet Explorer can display a page, these files must be stored on your hard disk. The location to which these files are copied is called the Internet Explorer cache. Imagine how much disk space gets used when you surf thousands of Web pages! Fortunately, there’s a way of getting some of that lost disk space back. First, select the Internet Options command from Internet Explorer’s Tools menu. Next, you’ll see the Internet Options properties sheet. Select the General Tab. There’s a button that allows you to delete files. This button refers to all of the cached Web pages that are stored on your system. Although clicking this button will clear the cache, you still need to prevent it from filling back up. Try also to reduce the number of days you cache history. The windows default is 20. I suggest you bring it down to 3 days. Conclusion… With only a few tweaks here and there, you can force Windows 98 to perform better. Of course, the tips above are only a starting point. There are other actions that you can take to create a faster, more efficient system. If you have any tips that you’d like to share, or if you’d like to discuss the tips that were presented here, contact me: Dr Byte, Chiangmai Mail. In the case of a death, what information should Americans who live in northern Thailand provide to the U.S. Consulate? What are the Consulate’s policies and procedures relative to the death of an American? Why does the Consulate even have to get involved when a U.S. citizen dies? Good questions, all, and I’m glad you asked. Nobody likes to think about these things, but knowing how the process works can perhaps help ease - a tiny bit - some of the stress and confusion that follows this kind of tragedy. Consulates and embassies are the U.S. government overseas. Thus, just as “the authorities” would have to be notified, at some point, in the case of a death in the United States, the Consulate must step in at some point in the aftermath of a death of an American in northern Thailand. Of course, you’re absolutely correct that making arrangements following a death is an intensely personal and private matter that is best handled by the family or friends of the deceased. The minimum consular responsibility is for us to prepare a document based on the Thai Death Certificate, called the Report of Death. The Report of Death is accepted by U.S. courts, banks, and other institutions as authority for the next of kin to resolve matters of estate. We also send the Report of Death to appropriate government agencies, such as Social Security and the Veterans Administration, which clears the way for family members to collect any benefits to which they might be entitled. There are also instances in which the Consulate does much more: the size of our role depends on whether the deceased has surviving family, and where that family lives. When a hospital, neighbor, or police officer notifies the Consulate of a death, the first thing we do is try to contact the next-of-kin. The next-of-kin is either the closest living relative (the order of relation is established by U.S. law), a legally-appointed representative, or the person the biological next-of-kin designates to handle their affairs. If the family is in Thailand, we help them in any way they request, but otherwise only prepare the documents the family will need. If the family is overseas, we carry out their instructions for the repatriation, local cremation, or interment of the remains. We also secure the overseas estate of the deceased, provide an inventory of personal effects, and repatriate the belongings or help arrange for their liquidation. Sadly, some Americans who die overseas were estranged from their families “back home.” In those cases, if the family will not involve themselves (or there is no surviving family), the Consulate makes all arrangements and donates the estate to local charities. Anyone who learns of the death of the U.S. citizen should contact the Consulate as soon as possible; we often have resources (passport records, etc.) to help locate the next-of-kin. * Make sure you have, and maintain, an up-to-date list of emergency contacts. If you have particular wishes for what is to happen in the event of your death, write them down and keep them with that list of contacts. If you suspect your next-of-kin might not honor those wishes, get legal papers drawn up. * Make sure your family, friends, or neighbors know that you have important documents that need to be consulted in the event of your death, and they know where they are. * If you register with the Consulate - and this one of a huge number of reasons all Americans in Thailand for more than a short vacation should register with the Consulate - you can list emergency contacts on the registration form. This will enable us to contact your family immediately, if we receive word of serious injury, illness or death. * Call your family to say hello. Not to imitate that venerable American institution, Ann Landers, but cases of estrangement are among the most heart-wrenching that we see. Be noble, show your strength: take the first step, and make contact. The worst that can happen is not nearly as bad as what happens if you don’t. Thanks, B.L., for the opportunity to get that off my chest. Do you have a question about visas, passports, travel to the United States, services for American citizens, or related issues? Ask the Consul. Send your e-mail to [email protected] with “ask the consul” in the subject line. If your question isn’t selected, you can get an answer by calling the Consulate at 053-252-629, from 8 to 4.